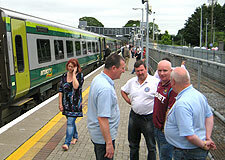 Once upon a time a merry band of Dublin Hammers gathered at Hueston Mainline Station on a warm but overcast Dublin Sunday morning. Some had decided to start early and were busy getting stuck into a box of bottled beer on the pavement outside the station (knacker drinking style), others opted for a slower start with coffee in the café. It wasn't long before JC's brother in-law (who happened to be the station manager at Hueston) was introduced and we were shown to the very front carriage of the intercity service to Cork. 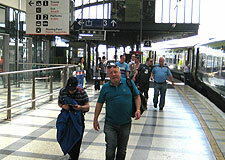 Seats were taken, flags were put up and 10 minutes after we were supposed to leave, the train eased out of the station. All was progressing nicely, the countyside sped by, papers were read and then the bags came down and the beers came out… things were warming up nicely! And then after an hour or so, the train slowed and stopped. 20 minutes later it started up again and crawled into the next station! Problem with the signals was the message coming over the intercom… although it took several listens to take in the whole message due to the singing from one or two of the tables! After another 30 minutes or so, those of us who had got off for a quick smoke were told to get back on… the train then crawled the next leg into Thurles, where another long wait ensued! We stood on the station wondering what was going on? Very little information? The latest rumour doing the rounds… problem with the train engine overheating. By this time we were supposed to be in Cork and plans of going for a nice lunch were disappearing fast. Tom, the new travel secretary was under pressure, strains of… "your getting sacked in the morning" wafted down the carriage. "That's it" said GP, "I'm going to 'have a word' with the driver". He marched down to the front of the train… when he got there the drivers cab was empty? The signal was green? "Get in mate, it's the pedal on the right" was the retort from one member! At this point the steady stream of Dublin hammers heading to the buffet carriage for more drink were told that the beer had sold out? We were not happy! 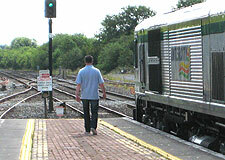 Eventually a new driver appeared… vandalism at Limerick Junction was reason number three! 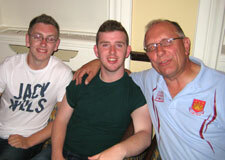 After that it was a straight run through, we arrived in Cork at 4pm, 6 hours to do a 3 hour journey! However we were there, the clouds had disappeared and the sun was shining. We headed off smartly to the Gresham Metropole Hotel, and credit to them they were 'on the ball' and within a short space of time we were all booked in and a steady stream of taxis got us all to Turners Cross. 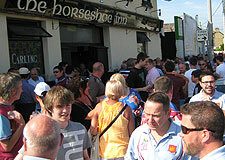 I have to say it was an impressive turn out from West Ham, all the pubs near the ground were filled with claret and blue… and as we drank our pre-match pints outside the Horseshoe pub, more and more West Ham streamed into the ground. We met up with other members who for one reason or another had traveled independently, songs were sung and more pints were consumed as the atmosphere grew in the hot Cork sunshine. 20 minutes before the 6pm kick-off we headed into the ground. The pitch was in excellent condition and the team looked fit and sharp decked out in the new home kit. 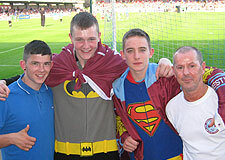 Saw a few lads with the new jersey, looks great. We took our seats behind the goal which fortunately was in the shade and the game kicked-off. 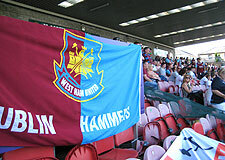 Won't go into too much detail on the match, the Hammers played a different team in each half, scored 6 goals to Corks 2! Most were bemused to see Titus Bramble start at the back, the paper had said he was training with us… but playing… please no… it wasn't long before he was skinned by one of the cork wingers…. Big Sam take note! 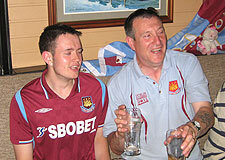 I have to say West Ham played a lot of football, not much sign of aimless long balls punted up the pitch. Noble missed a penalty, justice really after VazTe dived shamelessly, embarrassing! Ravel Morrison looked handy in the second half too. 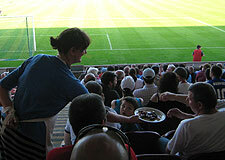 At half time, behind our stand, there was a promotion for Cloanakilty Black pudding... We had just taken our seats for the second half when two ladies bearing huge plates of Sausages and Black pudding arrived, the plates were handed along the rows of seats and for those of us who hadn't eaten since 7am that morning, it was a lifesaver! After the match we headed off to the 'Beer garden' pub, a short walk from the ground, which from the outside looked small, but upon entering turned out to be quite big! 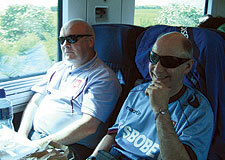 It was crammed with Hammers fans (inside and out) and we took over a seated area near the door. There was a trad session going on in the corner, but it wasn't too long before our singing began drowning out the lads playing, the barman came over and suggested we keep the noise down! It was warm inside so I went and stood outside where I met some of the Cork Hammers, Charley and his 3 kids and also Declan Kearney and his family, he saw my Dublin hammers shirt and introduced himself (his brother Dermot used to be a keen Dublin Hammer before work commitments took over), had a great chat. By this stage most members had headed back to the hotel, so I jumped into a cab and joined them in the bar. 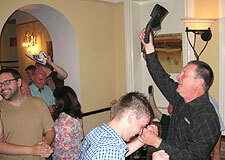 In ones and twos members and wags returned to rooms for a spruce up before returning to the bar. 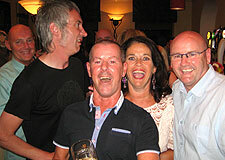 By now the levels of consumed alcohol were kicking in and a major sing song ensued! (Much to the horror of the few other hotel guests in the bar) Hammers favourites, as well as the odd Gilbert O'Sullivan song(?) were sung with gusto. "Stand Up. 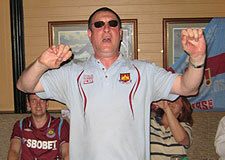 if you love West ham" got all members up on their feet, closely followed by "Shoes off if you love West Ham", after much laughter and the odd shoe waving in the air we headed off into town. 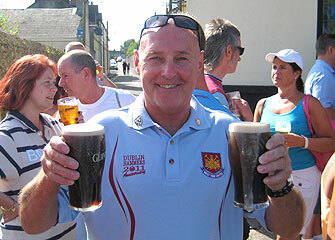 Colin O’Toole, (a former member, now living in Cork) guided a somewhat wobbly gang of Dublin Hammers to a late night bar going by the name of 'Crane Lane'. It turned out to be a great spot, good music, 3 different areas and an older clientele, which was handy seeing as the younger lads (the under 5’s) had headed off earlier in search of a nightclub. 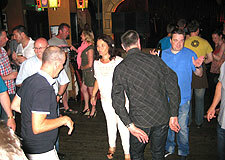 In the main room a band started playing a brand of upbeat reggae, not really my scene but the atmosphere was good. The second room was smaller and had a DJ pumping out a selection of 80/90s pop and hip-hop. Members moved between the two through the evening, but the night ended up with us all strutting our stuff in the smaller room. "What train?" remarked the president as we danced the night away. It was noticed on the way down that one member was limping, however half an hour later the same said chap was hopping around the dance floor like a teenager? Funny what a few drinks can achieve! 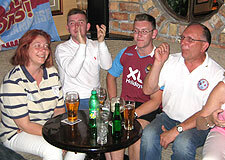 The night came to a close with a rousing rendition of Bubbles and then a hot and sweaty lot of Dublin Hammers staggered back to the hotel. The Secretary and I called into a grubby looking indian take away and we headed off to bed clutching our orders. The next morning he explained how he and his wife were tucked up in bed and had somehow managed to drop most of the kebab in the bed. Much hilarity ensued the next day at the retelling as members envisoned the secretary and his wife waking up with bits of lettuce and kebab stuck to their faces! I emerged from my room somewhat slowly around 9am, downstairs I found a few of the lads and we headed out in search of breakfast. 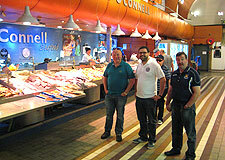 We made our way down to the English Market and were soon tucking into a large 'full Irish' each! It was another hot day, and we moved around the town slowly before finding ourselves a nice little spot in a bar with outside tables and chairs, from here we sat in the sunshine and watched the world go by while replenishing our liquid levels. 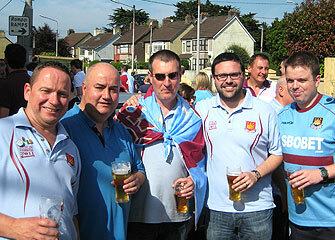 When we arrived back at the hotel we found the rest of our party sitting outside a pub, but tucked up in the shade! Phew, it was a roaster, you don't get too many like that in Ireland! We learned that another party had got up early and were back in the pub by 8am that morning(? )… 4 hours sleep and then back drinking again… would they make the train back… then there they were, and considering… were in good shape! Soon it was time to head off to the station to catch the train home, forays were made to a local supermarket for 'liquid refreshments' and we made our way slowly to the station. The train ride home went smoothly, plenty of songs and wise cracks… the train stopped in Thurles for a few minutes… there were a few nervous glances… a loud cheer rocked the carriage as the train pulled out! Back at Hueston station, a queue of 25 Dublin hammers lined up at the ticket office to submit our claim forms… over 2 hours delayed and we were entitled to a refund! Too right! Having driven to the station I headed off to the car park while the majority of members headed into Brannigans where Paul the barman had arranged for some food. 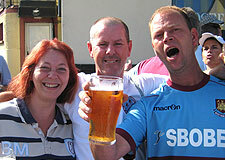 No doubt there were a few more pints sent down the hatch in the process. 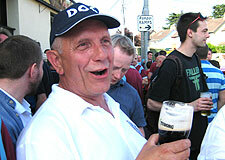 In fact it wouldn't surprise me if somewhere in Dublin a few of the lads are still going! Would like to thank Colin O'toole (our man on the inside) for guiding us to Crane Lane, a great spot. A big shout out to Steve and Julie from Northampton, who joined the ranks on the train ride down and happened to be staying in the same hotel…. good to have their company for the day, they headed back home honuory Dublin Hammers members and I'd say "a tad hungover" too! and last but not least the 3 lads from Deans Grange, good to have you along and hope you can get to some of the meetings this season! So there I was early Tuesday morning making my sandwiches for lunch when this song started playing in my head "Roy Keane is a traitor… he wears a traitors hat…"
Footnote: Two weeks later we recieved a letter from Iarnrod Eireann, apologising and giving us a full refund for the outward AND return journey!